I spent the last afternoon before leaving for Japan assembling various items of kit. Connecting different microphones to different recorders, wandering up and down our quiet suburban street pointing the wind-shielded shotguns at unsuspecting crows wheeling overhead and then transferring the resulting files to my laptop on the kitchen table. After a 20 minute hunt in the exploded jumble sale that is our attic, I finally tracked down a connector needed for the parabolic microphone. Once all the equipment was tested, I needed to then ensure that each piece – wrapped in a protective carapace of bubble-wrap, placed in a plastic sandwich box and insulated with foam or snug inside its manufacturer’s own case – could find a space inside the rucksack I was determined to squeeze everything into. The whole operation bore a parodic parallel to the intricate descriptions of Ranulph Fiennes’ accounts of his own immeasurably more serious endeavours in his autobiography “Mad, Bad and Dangerous to Know” which I happened to be reading. I knew from emails exchanged with Rupert and Toshihito during the planning process earlier in the summer that what I was bringing represented only a small fraction of what we would be bringing to the site. 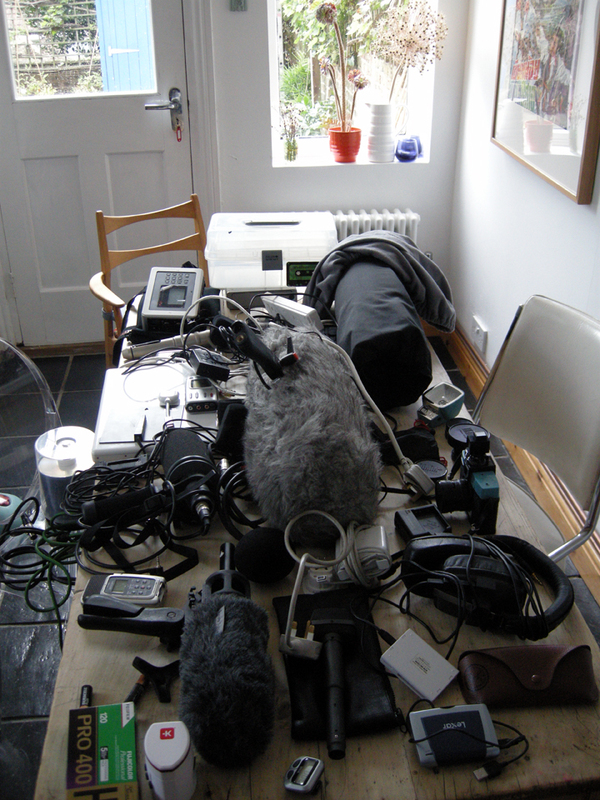 Rupert was taking some very high resolution audio equipment as well as a HD camera with its attendant lenses; Toshihito, able to use his car for transport, had organised what sounded like a truly staggering wealth of rich devices, prepared to record sound pressure levels, temperature, atmospheric pressure, vibration and the movements of our bodies as we slept. As satisfied as I could be with my packing, I went to collect my daughter from school. As I walked, I thought a little about that tense relationship that we establish between ourselves and our world through these complex apparatus of capture: how close do these recording systems bring us to what we want to reveal of the world? how far do they keep us distant – at arm’s length or further – from its dynamic life?